The following lessons will provide an introduction to basic algebra and problem solving skills. Welcome to the EQUATIONS (INEQUALITIES) - WORD PROBLEMS instruction unit. A MATHEMATICAL EXPRESSION CAN CONTAIN....? Permits introducing new terms that will not change the value of the expression because the change is zero. may be useful with associative law if (y + b) is known and b is known, but y is not. Permits introducing new terms that will not change the value of the expression because 1 times "anything" is still "anything". may be useful with associative law if (y /b) is known and b is known, but y is not. It is easy to discount the importance of these laws, but they are powerful techniques to transform an expression from something with little meaning into something that is known or extremely useful. What is 4(3 + y) - (5 - 3y)? A perfect square is the square of any integer. Is the product of two perfect squares still a perfect square in all cases? Leroy makes twice what Janice makes and Paola makes three times as much money as Janice. Paola makes $240. How much money does Leroy make? The goal of performing addition or subtraction on both sides of the equation is to isolate and solve the equation for a particular variable. How might you use addition or subtraction to simplify the following equation and isolate y? How might you use multiplication or division to simplify the following equation and isolate y? Almost any function or operation (not just add, subtract, multiply, and divide) can be performed in order to simplify the equation as long as it is done on both sides. What operation might best help evaluate the following equation? Cross multiplication is especially useful for ratio problems of the form a/b = c/d. Multiply one denominator by the other numerator and vice versa as follows. a × d = c × b. If you think about it, cross multiplication is essentially combining two steps of multiplying both denominators on both sides into one step. Combining like terms helps simplify equations and isolate one variable, often the variable to solve for, from other values and terms. 3x + 5 = 2x - 3. Let's see how that process differs for an inequality. Evaluate 2x + 5 < 3x - 3. The previous question indicates that, in general, the inequality sign does not change when manipulating both sides of the inequality, but it pays to be careful because when we swap the sides of the inequality we must also reverse the inequality symbol. There are two other times when we must also change the inequality symbol. The inequality symbol must be reversed when manipulations of the inequality include multiplicative and additive inverses as follows. An example of the first situation is as follows. Solve the inequality for x. Reverse the inequality symbol when taking the reciprocal of each side of the inequality. This is otherwise known as the multiplicative inverse and it also requires reversing the inequality symbol. A typical inequality question on the SHSAT may look like the following and include two inequalities. Which number line below represents the solution to the following inequality? Another, perhaps trickier, inequality problem you might also run into on the exam also incorporates two separate inequalities. If x + y < 4 and x - y > 7, then which of the following (x,y) pairs could be a solution to both inequalities? Lastly, make sure you don't fall into the following trap. Perhaps the best practice for getting comfortable with translating words into the correct equations is to practice the Problem Sets in this course. They tend to be shorter problems that purposely vary the wording to test students' abilities to understand what they read in a word problem. The following is one example of translating words into equations that you may confront on the exam. Three less than fifty percent of my age is 25. How old am I? Approximately 30 minutes in several videos. Part 1 begins on the Introduction page. Part 2 is on the Math Fundamentals page. How did Eratosthenes know the interior angle he measured opposite the shadow length on the right triangle formed between the vertical column and the shadow length measured in Alexandria was also the angle from the center of the earth to the arc spanned between the two cities Syene and Alexandria on the surface of the earth? He used a theorem you will be required to know for the SHSAT! Alternate interior angles in a transversal are congruent. 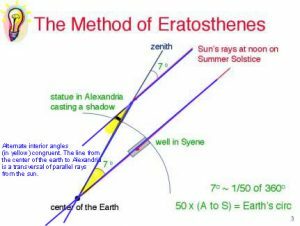 Most students at this point will understand the concept behind what Eratosthenes did and how he used SHSAT math to get the job done and think, “Kind of cool!” Then they will move on. Not this time, however. Even if you peeked at the solution to get here you will not as easily sail through the remaining discussions about design. The concept is only the beginning; not the end. Once Eratosthenes figured out the idea, he then had to design a test, build it, and then test his idea to get results. As future STEM (Science, Technology, Engineering & Math) based high school students and advocates of the scientific method, you too will have to labor through the same process. The remaining parts will ask you how you would design various elements of the experiment. There may be no one single answer but certainly some better answers than others. 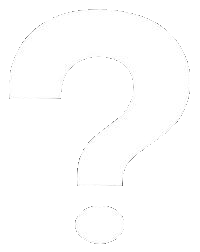 How would you arrange the shadow measurements in your test design? Could you make the test using a city other than Syene not on the Tropic of Cancer? Would you pick a location to the east, west, north, or south of the first location? Why? Part 4 is available on the Geometry Fundamentals page.